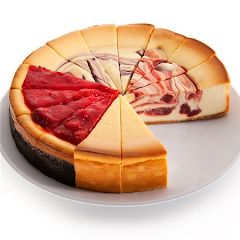 Fruit Cheesecakes are generally rich and also creamy; however, the oats in it along with the fruit filling makes it yummier. To start with, first of all heat the oven to 1750°C degrees (equivalent to 3500°F degrees). Press this crumb mixture at the bottom of a baking pan of size 10 inches and round in shape. Then spread mouth watering filling (fruit pie) on top of it and now sprinkle the balance crumbs. And bake it at 1750°C degrees (equivalent to 3500°F degrees) for about 15 minutes. Then remove it from the oven and allow it to cool. Take a large bowl, add and beat ingredients. Add and beat eggs by adding one after the other. Pour the batter into the prepared and readily kept crust. Now keep the pan over the larger roasting pan and then place it in an oven. Fill up with water till (1 inch) mark of roasting pan. Bake it at 1750°C degrees (equivalent to 3500°F degrees) for about 55 minutes. Once ready, from the oven, remove the cake, and leave it on the rack to cool and also refrigerate it overnight. Instead of fruit filling you can use blackberry pie filling. This recipe is very Nutritious with Calories - 366 kcal, Carbohydrates - 35.8 g, Protein - 5.8 g, and Fiber - 1 g.
Thank you for reading Fruit Cheesecake Recipe posted on the website Kwentology if you want to redistribute this article please include the link as the source. Have some kuwento to share? Contact us!